The skin on your hands, neck and chest is exposed to the sun and environmental pollutants daily, so it only makes sense that these areas are some of the first places that begin to show signs of age. These often neglected areas tend be dry and develop age and sun spots and even fine lines and wrinkles. 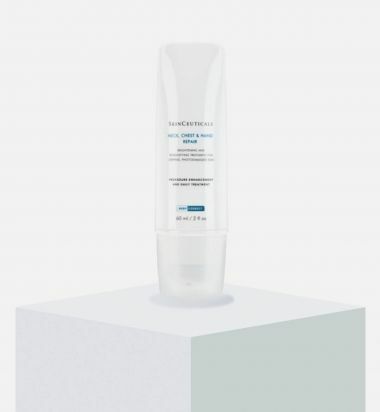 SkinCeuticals Neck, Chest & Hand Repair restores the look and feel of youthful skin. Formulated with powerful skin-brightening agents, this body lotion fades the look of sun damage and age spots while improving the appearance of skin texture.